Weigh your joey once a week and follow the directions on the feed chart. Never add thickeners or high protein cereals to any formula. The only exception may be a convalescing wombat. This should only be done under guidance from an experienced carer or vet. This is ideal for wombats as the formula changes as the wombat grows, just as it would with their mother. •Using Wombaroo ensures the joey weans at the correct age. •The joey never needs more than 195ml per day at around 4.4 kgs. By this time the joey will be eating grass and will eventually wean itself between 5 and 9 kgs depending on the wombat. Do Not add cereals and thickeners. The only thing that may need to be added is extra water (approximately 5 ml per bottle). I advise this extra water to help keep the wombat regular. Alternately, give the joey separate drinks of water each day. Wombaroo formula contains all the correct nutrients so your joey will absorb nearly everything and therefore poo less. Contrary to some misconceptions Wombaroo can be less expensive than other options because the joey needs less volume to fulfill their growth requirements and are therefore weaned earlier. 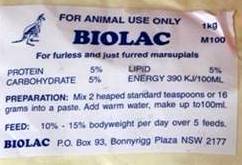 Biolac M100 – this is for furless joeys. 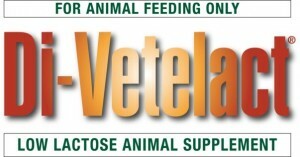 Biolac M150 – is a transition milk and should be used when dense fur has developed. Biolac M200 – should be used when the joey produces solid dark pellet droppings. This composition contains elevated lipid in the form of canola oil. Follow instructions on packet to make up formula. Always transition when changing between milk formulas. Transitioning should also be done when advancing to the next strength ie. 0.4 to .6 (Wombaroo) The transition should be done slowly over a week. 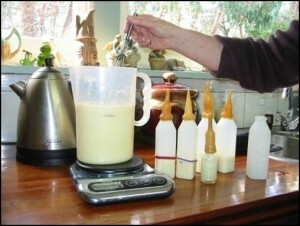 Changing milk formulas this way avoids any tummy upsets. 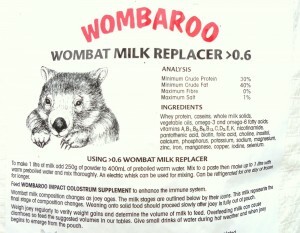 This is an all purpose milk formula and does not contain all the correct nutrients to fulfill the growth requirements for wombat joeys. 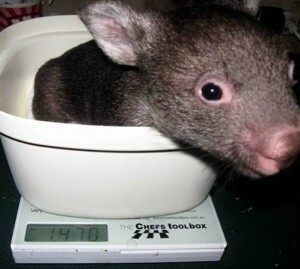 When this formula is given to Wombats, more volume is required due to the lack of nutrients. The increased volume leads to many health issues. Growth Chart for this formula suggest 10% of body weight to survive and 15% to thrive. As the wombat gains weight this becomes impossible and problems occur. I would not recommend feeding wombat joeys this formula once they have reached 800grms. in weight. Problems that occur – bloating, obese, fitting, thin hair cover, dry skin, failure to thrive. This formula should only be used short term until the appropriate formula is obtained. These are low lactose all purpose milk formulas which are designed for a variety of animals, not specifically native wildlife. As above this formula is impractical to feed the recommended 15% body weight as this will create an obese and potentially sick wombat. 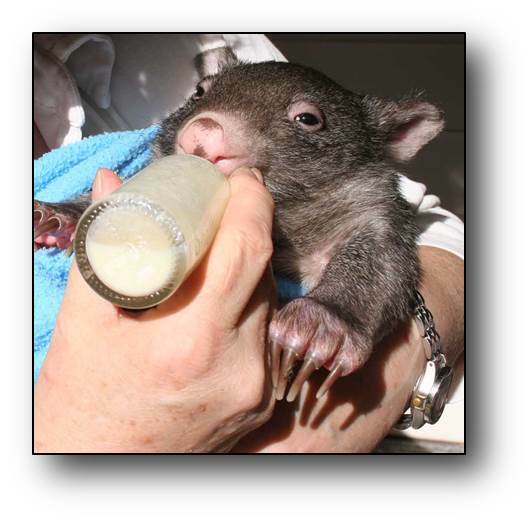 With this milk your wombat will not be getting the required nutrients at the correct stage of their development. 1. Wombat joeys are developing rapidly during their time in the pouch. These multi purpose formulas are recommended for orphaned puppies, kittens , etc which are fully developed when they are born). 2. At each stage of development wombat joeys have a specific requirement.